Apologies, I got a bit twisted there, the photo is of 18000 at Didcot - 18001 is back in Switzerland. The two Swiss built locos for the Great Western Railway by Brown Boveri and Vulcan Foundry's English Electric powered GT3 for British Railways were actually quite successful. What were the horsepower ratings? They look smaller and lighter than the American projects, which would have helped with all the problems. The GT3, 2,750hp, 38,000lbf tractive effort on an all up weight of 124tons, maximum service speed 90mph, exceeded in test (103mph) and in traffic timed by stopwatch and milepost at 105mph with 540 tons on the drawbar. 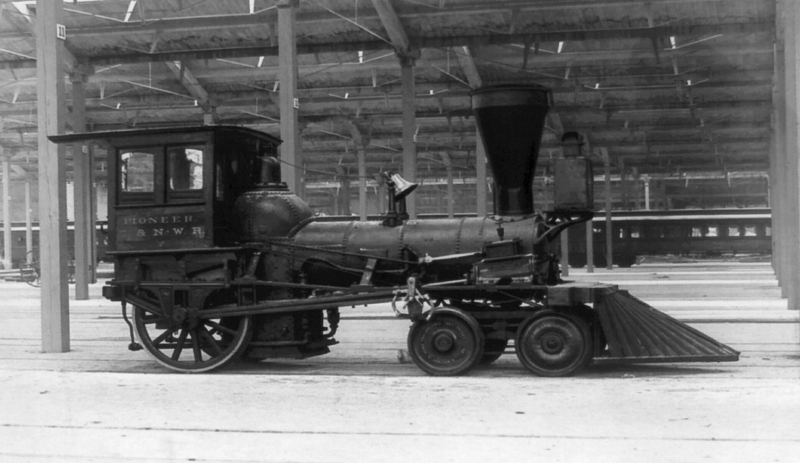 0-6-0: Common yard switcher, later in the steam era. These are excellent, fascinating photos and illustrations, and this is a very nice, informative thread. Please keep the information coming, and thanks to everyone! It pulled the first train on the first scheduled daily rail operation in the South, over just a few miles of track that ran inland (north) from the port of Charleston. The original was destroyed in a boiler explosion, so Southern Railway had this exact replica built. They hauled it all over the system on a flatcar for years, before it ended up in the SC state museum in Columbia. All the cars it pulled were of the two axle variety, as was being done in Europe at the time. Notice that the first car, with extra wood fuel, had room left over for some cotton bales. Bench seats in the coaches faced the sides. Ah. A Terrier. (Technically an A1 - or as later rebuilt an A1X) EDIT - no idea why this hasn't worked. I am of course referring to the second locomotive in the post three above this. I have a soft spot for Terrier's and especially for 662 or Martello as she was originally named. Here she is seen in the second livery (color scheme) of the at least four she carried through her long nigh on 90 year mainline career. 0-8-0: Rare, super heavy duty yard switcher. Under the Whyte notation for the classification of steam locomotives, 0-8-0 represents the wheel arrangement of no leading wheels, eight powered and coupled driving wheels on four axles and no trailing wheels. Locomotives of this type are also referred to as eight coupled. Examples of the 0-8-0 wheel arrangement were constructed both as tender and tank locomotives. The earliest locomotives were built for mainline haulage, particularly for freight, but the configuration was later also often used for large switcher (shunter) types. The wheel arrangement provided a powerful layout with all engine weight as adhesive weight, which maximised the tractive effort and factor of adhesion. The layout was generally too large for smaller and lighter railways, where the more popular 0-6-0 wheel arrangement would often be found performing similar duties. 2-4-2: Early experiments with guide wheels, in order to achieve higher safe speeds. Sets of four front guide wheels were attached via swivel mount, while single pairs were semi-rigid. Powered axles were always rigidly attached to the frame, while trailing guide wheels were mounted on a trailing arm style pivoting triangular frame, with a slide plate under the cab. Once these suspension standards were established, they lasted throughout the steam era. Under the Whyte notation for the classification of steam locomotives, 2-4-2 represents the wheel arrangement of two leading wheels on one axle, four powered and coupled driving wheels on two axles and two trailing wheels on one axle. The type is sometimes named Columbia after a Baldwin 2-4-2 locomotive was showcased at the 1893 World's Columbian Exposition held at Chicago, Illinois. The wheel arrangement was widely used on passenger tank locomotives during the last three decades of the nineteenth and the first decade of the twentieth centuries. The vast majority of 2-4-2 locomotives were tank engines, designated 2-4-2T. The symmetrical wheel arrangement was well suited for a tank locomotive that is used to work in either direction. When the leading and trailing wheels are in swivelling trucks, the equivalent UIC classification is 1'B1'. While a number of 2-4-2 tender locomotives were built, larger tender locomotive types soon became dominant. 4-2-0: Early experiments with guide wheels, in order to achieve higher safe speeds. Sets of four front guide wheels were attached via swivel mount, while single pairs were semi-rigid. Powered axles were always rigidly attached to the frame, while trailing guide wheels were mounted on a trailing arm style pivoting triangular frame, with a slide plate under the cab. Once these suspension standards were established, they lasted throughout the steam era. Under the Whyte notation for the classification of steam locomotives, 4-2-0 represents the wheel arrangement of four leading wheels on two axles, two powered driving wheels on one axle and no trailing wheels. This type of locomotive is often called a Jervis type, the name of the original designer. The 4-2-0 wheel arrangement type was common on United States railroads from the 1830s through the 1850s. The first 4-2-0 to be built was the Experiment, later named Brother Jonathan, for the Mohawk and Hudson Railroad in 1832. It was built by the West Point Foundry based on a design by John B. Jervis. Having little else to reference, the manufacturers patterned the boiler and valve gear after locomotives built by Robert Stephenson of England. 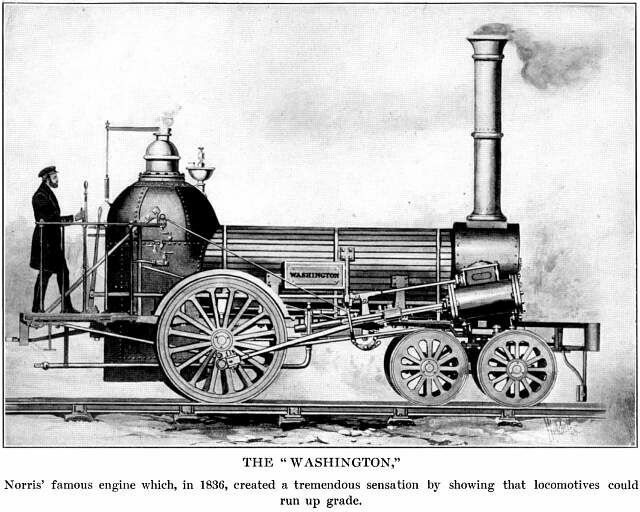 A few examples of Stephenson locomotives were already in operation in America, so engineers did not have to travel too far to get their initial ideas. In England, the 4-2-0 was developed around 1840 from the 2-2-2 design of Stephenson's first Long Boiler locomotive, which he had altered to place two pairs of wheels at the front to improve stability, with the outside cylinders between them. In the United States, the design was a modification of the 0-4-0 design, then in common use. The 0-4-0 proved to be too rigid for the railroads of the day, often derailing on the tight curves and rapid elevation changes of early American railroads. For the 4-2-0, Jervis introduced a four-wheel leading truck under the locomotive's smokebox. It swiveled independently from the main frame of the locomotive, in contrast to the English 4-2-0 engines which had rigid frames. The pistons powered a single driving axle at the rear of the locomotive, just behind the firebox. 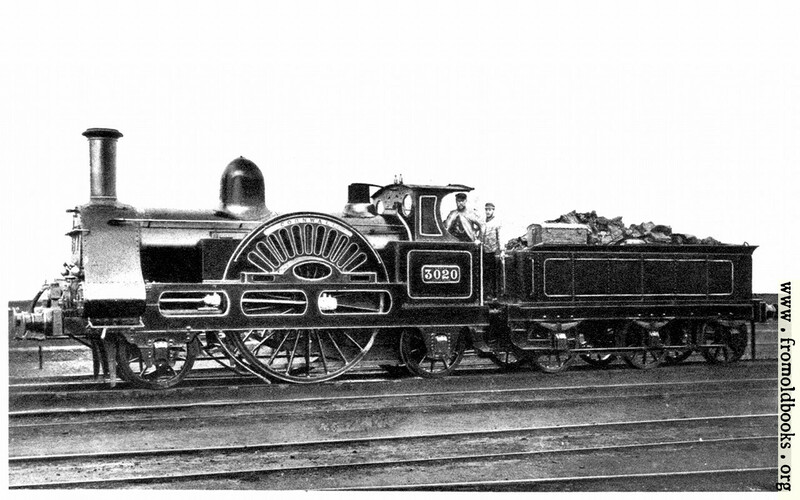 This design resulted in a much more stable locomotive which was able to guide itself into curves more easily than the 0-4-0. This design proved so effective on American railroads that many of the early 0-4-0s were rebuilt as 4-2-0s. The 4-2-0 excelled in its ability to stay on the track, especially those with the single driving axles behind the firebox, whose main virtue was stability. However, with only one driving axle behind the firebox, the locomotive's weight was spread over a small proportion of powered wheels, which substantially reduced its adhesive weight. On 4-2-0 locomotives which had the driving axle in front of the firebox, adhesive weight was increased. While this plan placed more of the locomotive's weight on the driving axle, it reduced the weight on the leading truck which made it more prone to derailments. One possible solution was patented in 1834 by E.L. Miller and used extensively by Matthias W. Baldwin. It worked by raising a pair of levers to attach the tender frame to an extension of the engine frame, which transferred some weight from the tender to the locomotive frame and increased the adhesive weight. An automatic version was patented in 1835 by George E. Sellers and was used extensively by locomotive builder William Norris after he obtained rights to it. This system used a beam whose fulcrum was the driving axle. On flat and level surfaces, the beam would be slightly raised, but upon starting or on grades, the resistance made the beam assume a horizontal position which caused the locomotive to tip upward. A more practical solution, first put into production by Norris, relocated the driving axle to a location on the frame in front of the locomotive's firebox. This was done because Baldwin refused to grant rights to Norris to use his patented "half-crank" arrangement. Cantilevering the weight of the firebox and the locomotive crew behind the driving axle placed more weight on the driving axle without substantially reducing the weight on the leading truck. However, Norris's design led to a shorter wheelbase, which tended to offset any gains in tractive force on the driving axle by reducing the locomotive's overall stability. A number of Norris locomotives were imported into England for use on the Birmingham and Bristol Railway since, because of the challenges presented by the Lickey Incline, British manufacturers declined to supply. Once steel became available, greater rotational speeds became possible with multiple smaller coupled wheels. Five years after new locomotive construction had begun at the West Point Foundry in the United States with the 0-4-0 Best Friend of Charleston in 1831, the first 4-4-0 locomotive was designed by Henry R. Campbell, at the time the chief engineer for the Philadelphia, Germantown and Norristown Railway. Campbell received a patent for the design in February 1836 and soon set to work building the first 4-4-0. For the time, Campbell's 4-4-0 was a giant among locomotives. Its cylinders had a 14 inches (356 millimetres) bore with a 16 inches (406 millimetres) piston stroke, it boasted 54 inches (1,372 millimetres) diameter driving wheels, could maintain 90 pounds per square inch (620 kilopascals) of steam pressure and weighed 12 short tons (10.9 tonnes). Campbell's locomotive was estimated to be able to pull a train of 450 short tons (410 tonnes) at 15 miles per hour (24 kilometres per hour) on level track, outperforming the strongest of Baldwin's 4-2-0s in tractive effort by about 63%. However, the frame and driving gear of his locomotive proved to be too rigid for the railroads of the time, which caused Campbell's prototype to be derailment-prone. As the 1840s approached and more American railroads began to experiment with the new 4-4-0 locomotive type, the 4-2-0 fell out of favor since it was not as able as the 4-4-0 to pull a paying load. 4-2-0s continued to be built into the 1850s, but their use was restricted to light-duty trains since, by this time, most railroads had found them unsuitable for regular work. In England, for freight work, four-coupled and six-coupled engines were performing well. However, for passenger work the aim was greater speed. Because of the fragility of cast-iron connecting rods, "singles" continued to be used, with the largest driving wheels possible. For some reason, British manufacturers did not take up the idea of mounting the forward wheels on a bogie for some years. There were possibly fears about their stability and with a long rigid frame, greater speed was achieved, albeit at the cost of a very rough ride and damage to the track. The culmination of this approach was seen in the Crampton locomotive where, to make the driving wheels as large as possible, they were mounted behind the firebox. The Civil War connection - @DaveBrt 's web site https://www.csa-railroads.com/ has 9 hits to 4-2-0s as used by Confederate Railroads. 2-2-2: Early experiments with guide wheels, in order to achieve higher safe speeds. Sets of four front guide wheels were attached via swivel mount, while single pairs were semi-rigid. Powered axles were always rigidly attached to the frame, while trailing guide wheels were mounted on a trailing arm style pivoting triangular frame, with a slide plate under the cab. Once these suspension standards were established, they lasted throughout the steam era. Under the Whyte notation for the classification of steam locomotives, 2-2-2 represents the wheel arrangement of two leading wheels on one axle, two powered driving wheels on one axle, and two trailing wheels on one axle. The wheel arrangement both provided more stability and enabled a larger firebox than the earlier 0-2-2 and 2-2-0 types. This configuration was introduced in 1834 on Robert Stephenson's 'Patentee locomotive' but it was later popularly named Jenny Lind, after the Jenny Lind locomotive which in turn was named after the popular singer. They were also sometimes described as Singles, although this name could be used to describe any kind of locomotive with a single pair of driving wheels. The 2-2-2 configuration appears to have been developed by Robert Stephenson and Company in 1834, as an enlargement of their 2-2-0 Planet configuration, offering more stability and a larger firebox. The new type became known as Stephenson's Patentee locomotive. Adler, the first successful locomotive to operate in Germany, was a Patentee supplied by Robert Stephenson and company in component form in December, 1835 was one of the earliest examples. Other examples were exported to the Netherlands, Russia and Italy. By 1838 the 2-2-2 had become the standard passenger design by Robert Stephenson and Company. Eighteen of the first nineteen locomotives ordered by Isambard Kingdom Brunel for the opening of the Great Western Railway in 1837/8 were of the 2-2-2 type. These included six 2-2-2 locomotives built by Charles Tayleur at his Vulcan Foundry. Also in 1837 the successful North Star broad gauge locomotive was delivered to the Great Western Railway by Stephenson, becoming the first of a class of twelve locomotives by 1841. Incidentally, although this engine is engraved on the tombstones of Driver William Scaife and Fireman Rutherford in Bromsgrove Churchyard at the bottom of the Lickey Incline, it wasn't the engine whose boiler exploded and killed them. That was an experimental engine called Eclipse. We don't know if they had tampered with the safety valve, but the fact that the bang occurred in Bromsgrove Station at the foot of the bank is highly suggestive. This was before John Ramsbottom delivered us from evil by inventing the modern tamper proof safety valve. 2-4-0: Early experiments with guide wheels, in order to achieve higher safe speeds. Sets of four front guide wheels were attached via swivel mount, while single pairs were semi-rigid. Powered axles were always rigidly attached to the frame, while trailing guide wheels were mounted on a trailing arm style pivoting triangular frame, with a slide plate under the cab. Once these suspension standards were established, they lasted throughout the steam era. Under the Whyte notation for the classification of steam locomotives, 2-4-0 represents the wheel arrangement of two leading wheels on one axle, four powered and coupled driving wheels on two axles and no trailing wheels. The notation 2-4-0T indicates a tank locomotive of this wheel arrangement on which its water and fuel is carried on board the engine itself, rather than in an attached tender. The 2-4-0 configuration was developed in the United Kingdom in the late 1830s or early 1840s as an enlargement of the 2-2-0 and 2-2-2 types, with the additional pair of coupled wheels giving better adhesion. The type was initially designed for freight haulage. 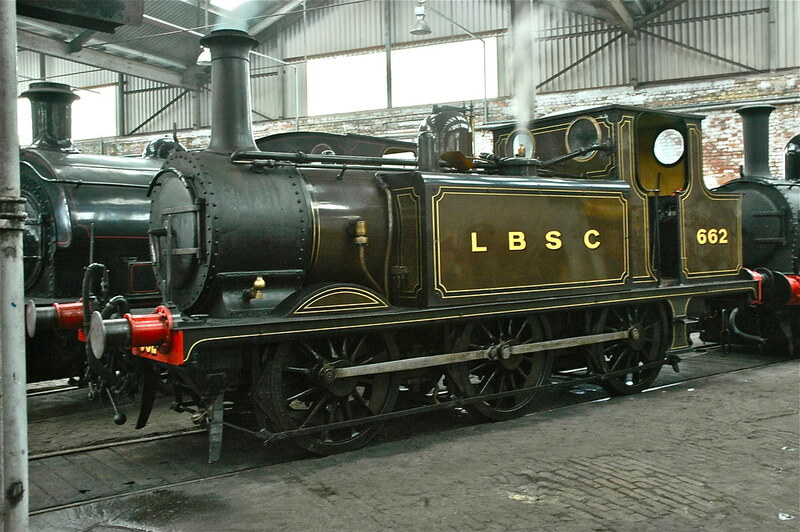 One of the earliest examples was the broad-gauge GWR Leo Class, designed by Daniel Gooch and built during 1841 and 1842 by R and W Hawthorn and Company, Fenton, Murray and Jackson, and Rothwell and Company. 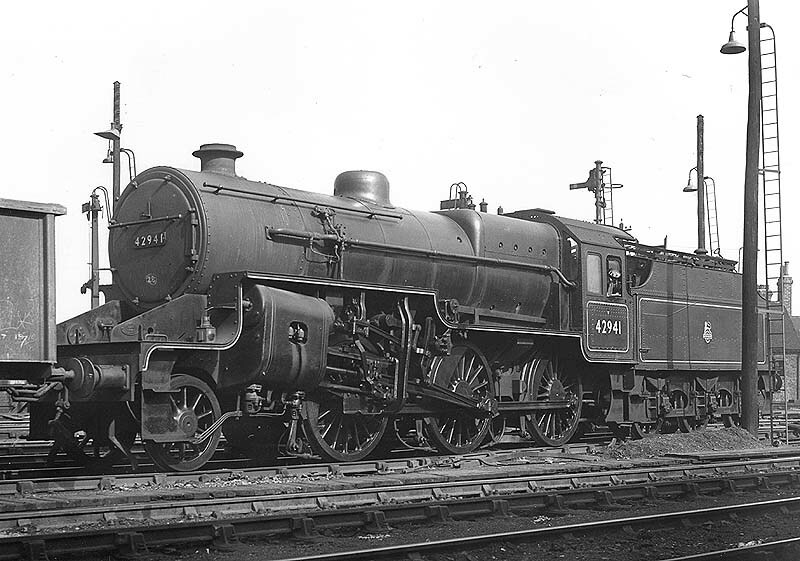 Because of its popularity for a period with English railways, noted railway author C. Hamilton Ellis considered the 2-4-0 designation to have the nickname (under the Whyte notation) of Old English. During 1846-47, Alexander Allan of the newly established London and North Western Railway (LNWR) created the Crewe type of locomotive, with a 2-2-2 wheel arrangement for passenger classes and 2-4-0 for freight. During the 1850s and 1860s these designs were widely copied by other railways, both in the United Kingdom and overseas. 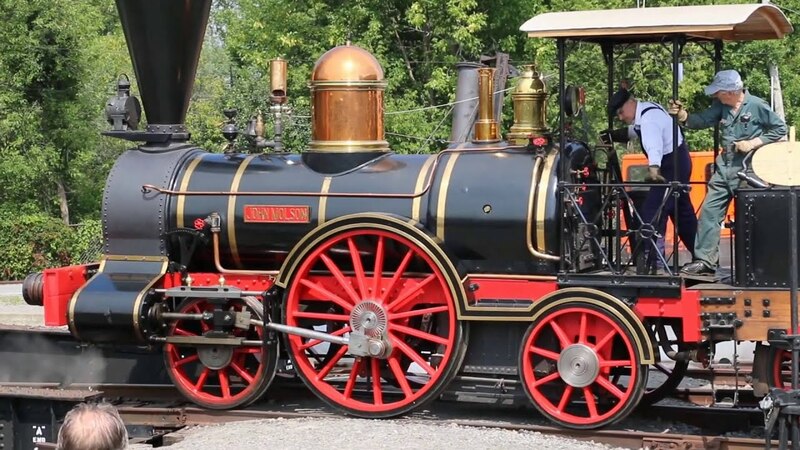 During the mid-1840s, Sir John Hawkshaw developed a new style of 2-4-0 passenger locomotive with outside cylinders in front of the leading wheels and the rear driving axle behind the firebox. This layout provided steady running at high speeds, despite a long overhang at the front. Joseph Beattie of the London and South Western Railway was one of the first British locomotive engineers to use this type on express locomotives. From 1858, he began experimenting with 2-4-0 designs for passenger work, culminating in his Seven-Foot 2-4-0 express passenger locomotives, built between 1859 and 1868. 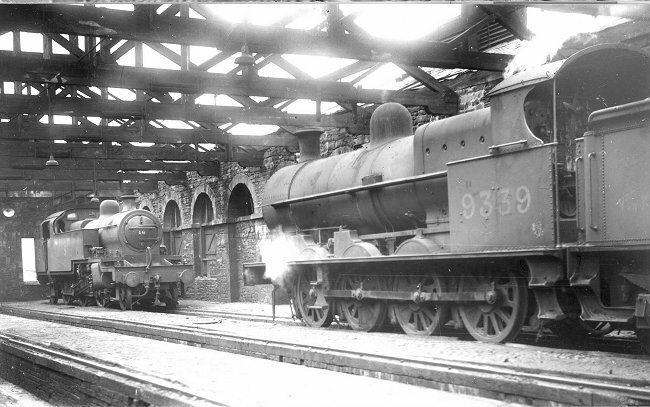 Beattie was also responsible for the long-lived 0298 Class of 2-4-0 well tanks, designed for suburban passenger work in 1874, some examples of which were still working in 1961. A locomotive of this type hauled the first Orient Express from Paris to Munich, a notable achievement for such a small engine. 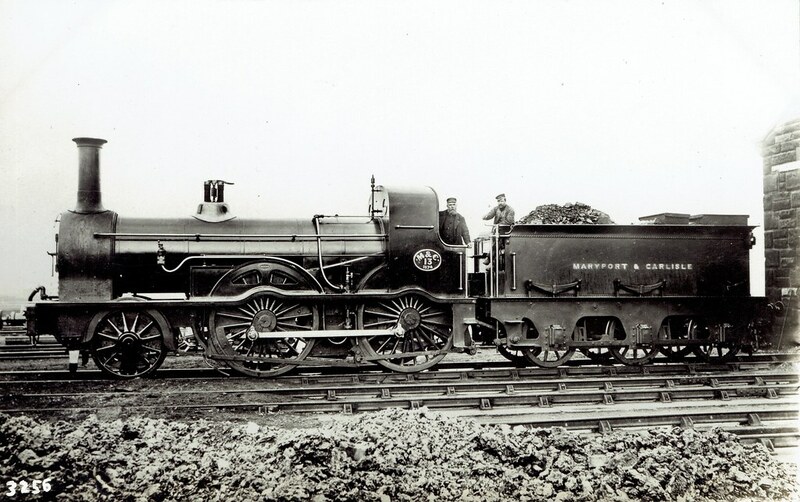 After 1854, the Hawkshaw type of 2-4-0 was adopted by Beyer, Peacock and Company, who built many examples of the type for export, including to the Swedish State Railways (Statens Järnvägar) in 1856 and the Zealand Railway in Denmark in 1870. 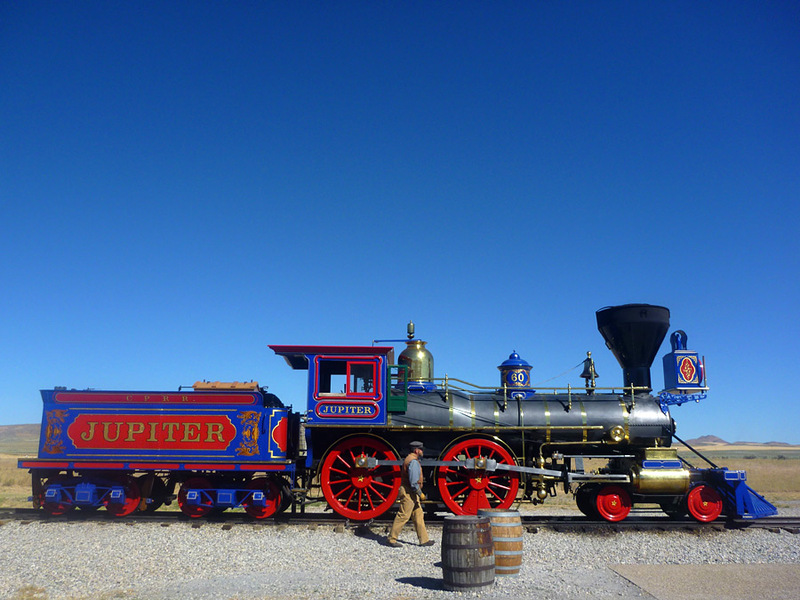 4-4-0: The closest thing America ever had to a standard locomotive. Before, during, and after the Civil War, it was the locomotive of choice for nearly every assignment. The configuration looked good on paper, and it proved itself in the real world, handling sharp curves, curve transitions, and poor track conditions quite well. Railroads were so happy with them that alternatives to the design were not seriously considered for decades. The only obvious weakness was a speed restriction on backing up. The design is somewhat of an optical illusion. It looks nearly balanced, but most of the heavy stuff including the firebox and most of the boiler is over the drive wheels. The smokebox up front (under the stack) is hollow space. The guide wheels only needed enough weight on them to properly steer the frame and take most of the stress off the drive wheel flanges. Not only did the locomotive perform better than the older designs, but rail wear was significantly reduced. 2-6-0: The first significant step away from standardization, after the war. In hilly terrain, longer freight trains had lower speeds. Two guide wheels up front seemed to be enough in that situation, and six drive wheels provided better traction. Passenger trains stuck with the 4-4-0 design, in most situations. Under the Whyte notation for the classification of steam locomotives, 2-6-0 represents the wheel arrangement of two leading wheels on one axle, usually in a leading truck, six powered and coupled driving wheels on three axles and no trailing wheels. This arrangement is commonly called a Mogul. In the United States of America (USA) and Europe, the 2-6-0 wheel arrangement was principally used on tender locomotives. 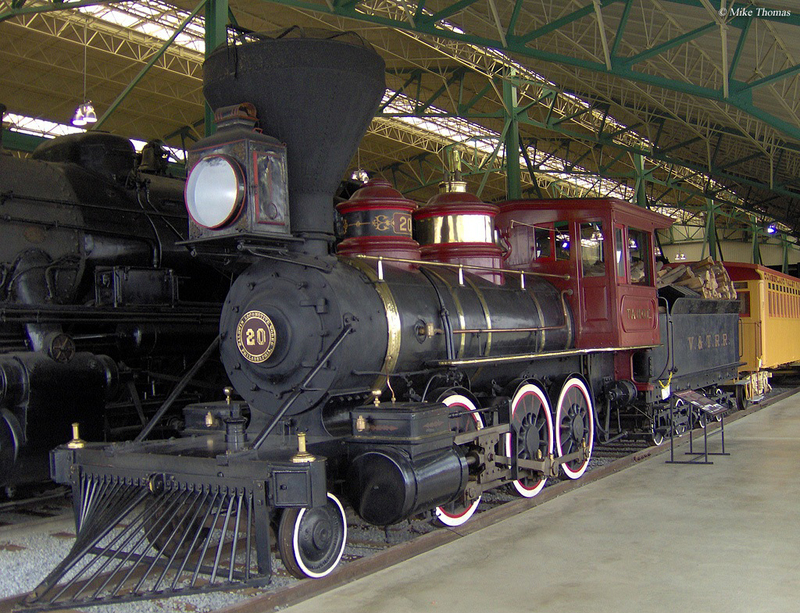 This type of locomotive was widely built in the United States from the early 1860s to the 1920s. 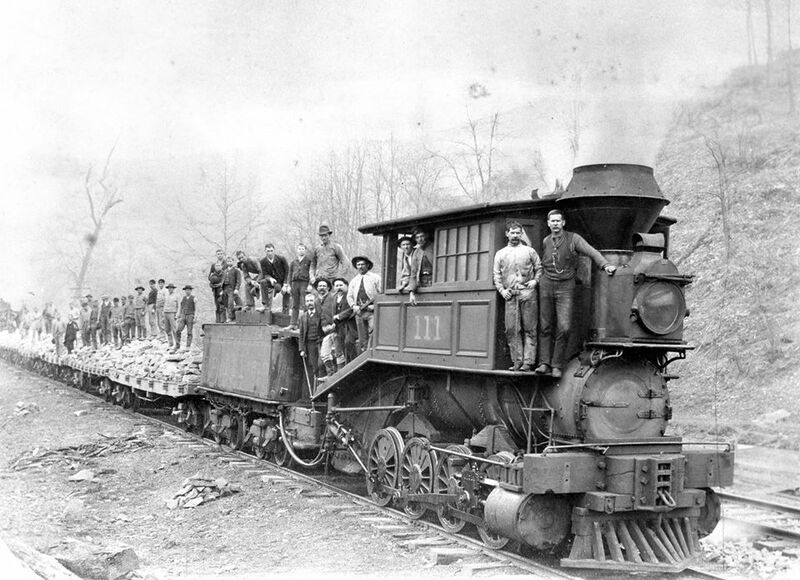 Although examples were built as early as 1852–53 by two Philadelphia manufacturers, Baldwin Locomotive Works and Norris Locomotive Works, these first examples had their leading axles mounted directly and rigidly on the frame of the locomotive rather than on a separate truck or bogie. On these early 2-6-0 locomotives, the leading axle was merely used to distribute the weight of the locomotive over a larger number of wheels. It was therefore essentially an 0-8-0 with an unpowered leading axle and the leading wheels did not serve the same purpose as, for example, the leading trucks of the 4-4-0 American or 4-6-0 Ten-Wheeler types which, at the time, had been in use for at least a decade. The first American 2-6-0 with a rigidly mounted leading axle was the Pawnee, built for heavy freight service on the Philadelphia and Reading Rail Road. In total, about thirty locomotives of this type were built for various American railroads. While they were generally successful in slow, heavy freight service, the railroads that used these first 2-6-0 locomotives didn't see any great advantages in them over the 0-6-0 or 0-8-0 designs of the time. The railroads noted their increased pulling power, but also found that their rather rigid suspension made them more prone to derailments than the 4-4-0 locomotives of the day. Many railroad mechanics attributed these derailments to having too little weight on the leading truck. The first true 2-6-0s were built in the early 1860s, the first few being built in 1860 for the Louisville and Nashville Railroad. The new design required the utilisation of a single-axle swivelling truck. Such a truck was first patented in the United Kingdom by Levi Bissell in May 1857. In 1864, William S. Hudson, then the superintendent of Rogers Locomotive and Machine Works, patented an equalized leading truck that was able to move independently of the driving axles. This equalized suspension worked much better over the uneven tracks of the day. 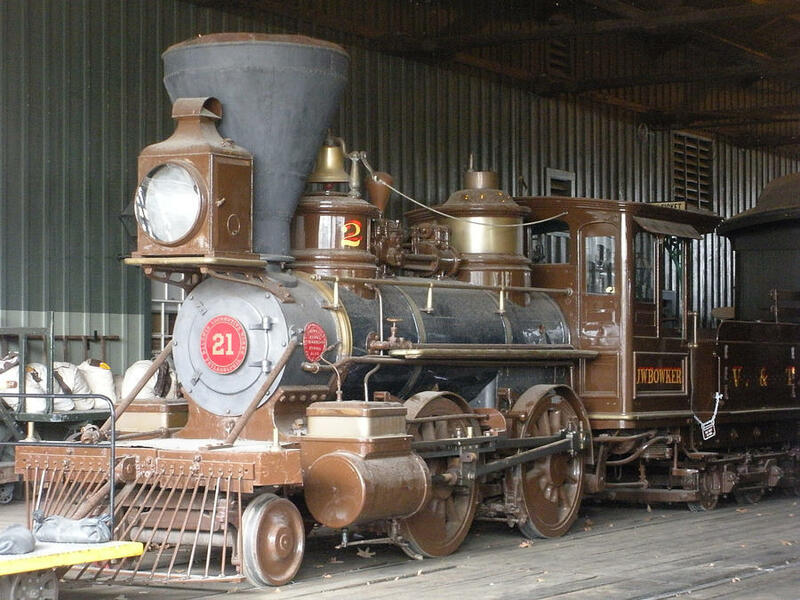 The first locomotive built with such a leading truck was likely completed in 1865 for the New Jersey Railroad and Transportation Company as their number 39.